Ruggedly built, features-rich, low-profile boom stand. 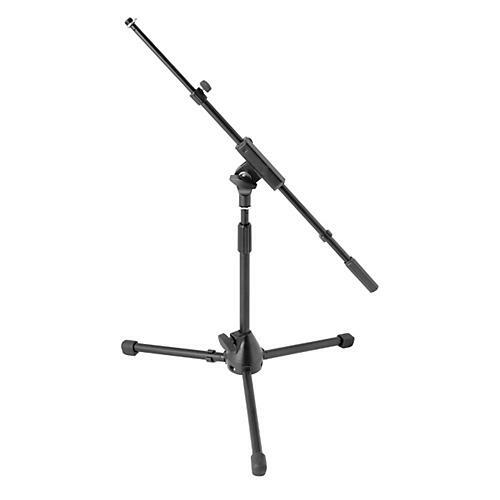 The On-Stage MS9411TB+ is a compact, heavy-duty microphone stand that is ideal for miking bass drums, guitar amplifiers, or anywhere else where a low profile mic stand is needed. Improved features include extra-thick steel shafts, ergonomically designed and anodized machined aluminum center clutch, steel leg housing with adjustable heavy-duty leg mounts, and a scratch-resistant finish. A patent-pending anti-rotational device on the lower shaft allows for true one-handed height adjustments. A solid steel 5/8-27" threaded lug, oversized shock mount locking washer and steel counterweight complete this professional package. Get one for your amp or kick drum today and reduce your stage clutter. Height Adj. : 15"-24" > Boom Adj. : 19"-33" > Base Spread: 19"